Battling left back Les Thompson started his career on Humberside with Hull City, in a forward role foreign to those who watched him on the Turf in his Burnley career. In the four years he spent at Boothferry Park he made only a handful of appearances and also spent time on loan at Scarborough. In 1991 he was signed by Maidstone United and was a regular starter as the club struggled on with financial problems. As the Clarets were crowned champions of the 4th division and looked to build on their success, Jimmy Mullen made his move for Thompson. The cash problems in Kent allowed Thompson to negotiate himself a free transfer to Burnley, despite the fact that he was rated at around the £50k mark by his parent club. He was expected to be the replacement for veteran Joe Jakub, but the wily Scot managed to retain his place for most of our first season in Division 2. 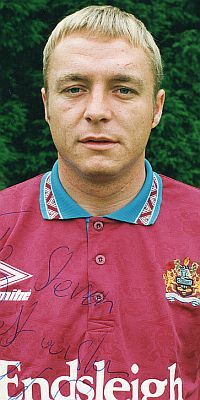 Subsequently Thompson was loaned out to Conference club Wycombe to give him game time and he aided them in their Championship season of 92-93. His second season with us told a different story. Although the pre-season looked like he would again miss out of a first team place, this time to Paul Wilson, he forced his way into the side and Mullen was left with no alternative but to play him. His one season as a regular saw him garner cult status due to his somewhat uncultured style of play and never-say-die attitude. The season ended on a high with the play-off victory over Stockport, in which Thompson played. However, with Division 1 on the horizon and a new, much-heralded replacement arriving in Chris Vinnicombe, Thompson was released before he could get a taste at the higher level. He dropped into local non-league, firstly with Accrington Stanley, before spells with other sides such as Nelson and Clitheroe. He took his coaching badges in 2000, in the same study group as former Claret Chris Woods, and hoped to get into management or coaching. Although he only appeared regularly with us for one year, Les Thompson definitely made an impact on me and despite his lack of skill and finesse he was a personal favourite. Division 1 may have been a step too far - we'll never know - but I certainly think Andy Bernal would have had trouble breaking the jaw of this left back if we'd have kept him on.